I big chopped! 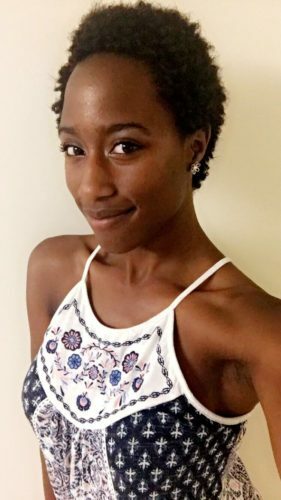 I cut off all of my relaxed ends on May 20th, 2017 after 8 months of transitioning. I’ve been relaxed for as long as I can remember with my last relaxer being September 27th, 2016. 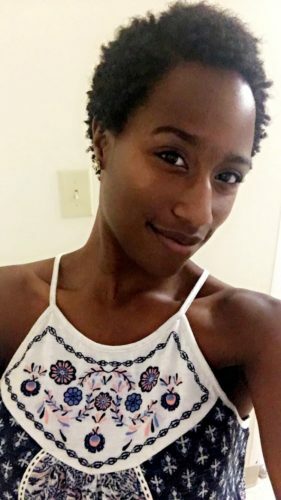 My decision to transition from relaxer back to my hair’s natural state resulted from watching too many beauty/hair gurus on Youtube, feeling “bleh” about my relaxed hair and noticing so many girls around my college campus with thick, flourishing hair! I wanted to embrace my coils while also getting my hair back healthy, thick and full. This isn’t the first time I’ve transitioned. My first dabble in a natural hair transition was in 2014 during my senior year of high school. I wore a mix of box braids and twists for about 6 months, then gave up. I cut my hair into a super cute bob (which I loved!) then grew it back out to collarbone length. Everything was going great, until I entered college in the August of 2015. Most likely a mix of stress, feeling overwhelmed and always rushing everything, my hair started to break off and thin throughout my freshman year. By sophomore year of college, I did not like my hair. From November to January and again from March to May, I wore my hair in braids with simple protective styles. I strongly advise to NOT do what I did. Although my hair was growing fast, the relaxed ends were quickly breaking off and my felt dry and brittle. The left, back side of my hair was natural while one side could touch the back of my head! I wanted to hang on to my scraggly ends, but my mother thought otherwise. I went to her bathroom, washed my hair, then prepared for her to cut off my relaxed ends. Unlike the hundreds of big chopped videos, I didn’t cry and I wasn’t the least bit sad. I was shocked to say the least. I hadn’t known what to expect – my hair was now short, coily and “foreign” to me. How do I style this? What will other people think? After a few days of trying out products and attempting styles, the new look finally started to settle on me. And, of course, compliments from others did boost my confidence. Now, it’s been almost two weeks and I’m learning what does and does not work for me. In the process, I’m crafting my personal hair care routine to maintain health and growth. My “hair goal” is to get my hair to a length in which I can create more styles. Until then, I’ll be enjoying my TWA! I can’t wait to share more of my natural hair journey. Comment below with your hair tips and tricks! Loooove the big chop! You have a beautiful face for short hair. Thank you so much, Courtenay! !